to be the only New Hampshire team chosen for this responsibility. 1519 was also given the opportunity to demonstrate the Beta test robot at off season tournaments River Rage and Battle of the Bay. Also, from June 13th to 15th, members of the team volunteered at the Rock’n Ribfest in Anheuser-Busch in Merrimack, NH. They helped with cleaning and assisted as waiters and waitresses during the event. They also had the robot of 2014 on display, and ran a demonstration with the 2012 robot. looks like. A few weeks later on Thursday, August 7th, 1519 went to a golf event also hosted by PTC as well as The New England Golf Charity Classic. A portion of the proceeds were donated to FIRST. The four team members who attended the event had the privilege to meet with potential sponsors and speak with the president of FIRST, Donald Bossi. At the event, 1519 was asked by Sheila Rogers from PTC to host a table in the tent, displaying what FIRST is all about, sharing it’s ideals and displaying our 2014 robot. 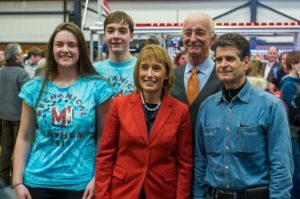 Robotics high school teams to compete in the Granite State District Event. Both days promised a thrilling competition with a myriad of competitive and creatively constructed robots. 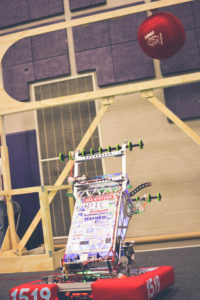 Equipped with a roller claw capable of harvesting balls from either side of the robot, Kaizen propelled its way into the finals with its high shooting accuracy. The robust 8-wheel drive-base proved strong yet maneuverable in skilled defense. In autonomous mode when robots operate via pre-programmed instructions, Kaizen wowed allies and opponents with its 40-point autonomous program which scored both its ball and a partner’s ball into the high goal within the ten-second period. During alliance selection Saturday afternoon, the 2nd ranked team, “C.H.A.O.S.” (131) from Manchester, NH invited Mechanical Mayhem and “The Robotics Team” (1786) from Dublin, NH to join their alliance as they dove into the elimination matches. In four exciting matches, the alliance charged through the quarter-finals and semi-finals undefeated. Finally, the alliance faced the top seeded team “Entropy” (138) from Amherst, NH and their alliance partners, “Bobcat Robotics” (177) from South Windsor, CT and “Potential Energy” (3323) from Litchfield, NH in the finals. After three fast-paced matches, Mechanical Mayhem went home as Granite State District Finalists and winners of the Gracious Professionalism® Award. Currently the team is tweaking and re-adjusting the robot, code, and award presentations in preparation for upcoming tournaments. 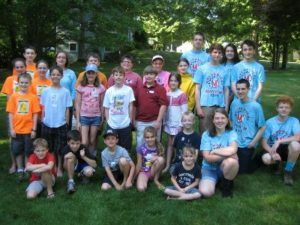 These competitions include the Rhode Island District Event on March 20-22, and, if they qualify, the New England Championship in Boston on April 10-12. The objective of Aerial Assist (2014 FRC Game Animation) is to score as many 25-inch balls in goals as possible during a two minute and thirty second match. The game is played by two competing alliances, each alliance composed of three robots. They compete on a flat, 25 x 54-foot field straddled by a truss, a metal beam in the center of the field, just over six feet above the ground. 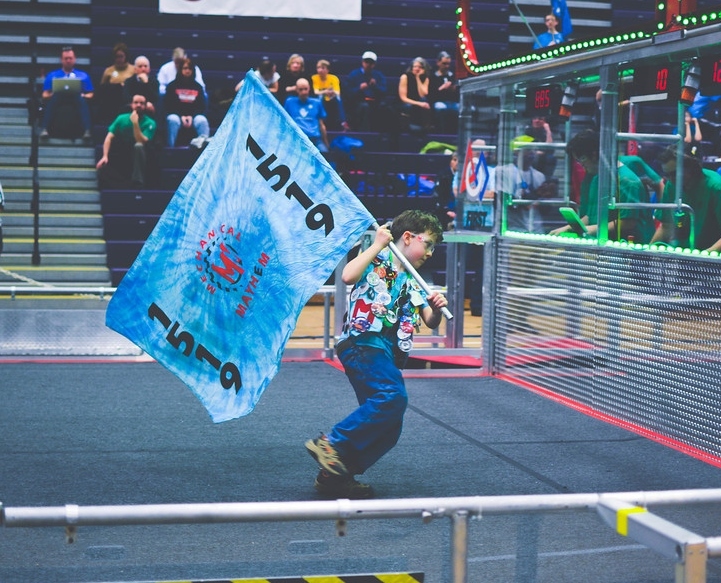 When alliance partners work together to score goals, additional points are awarded to the teams. The match begins with a 10-second autonomous period when robots operate using pre-programmed instructions without driver control. Additionally, both the high and low goals on a select corner of the field are randomly designated “hot” for five seconds. 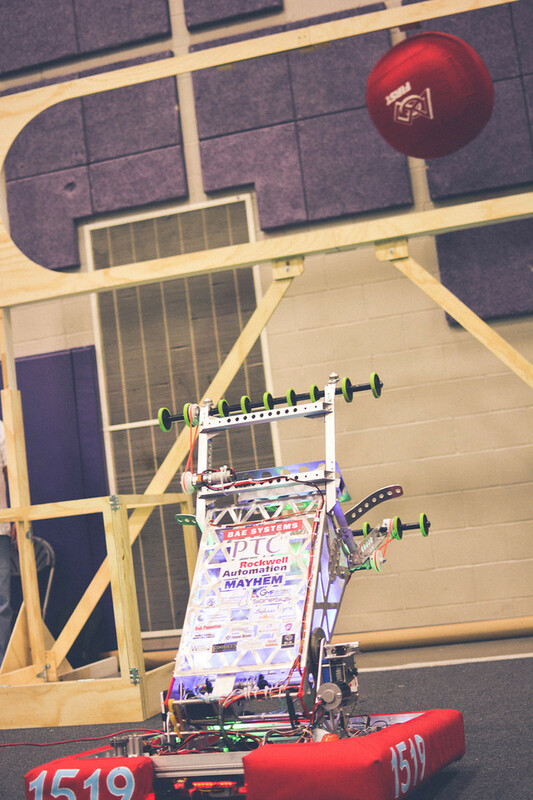 For each ball scored in a “hot” goal during autonomous, the alliance earns bonus points. The drive teams remotely control robots from behind a protective wall for the remaining two-minute- and-twenty-second tele-op period. After all the balls originally given to each alliance in autonomous are scored (0-3), one new ball is placed onto the field. Once this ball is scored, the alliance will be given another. Points are gained by throwing over the truss, catching, and scoring balls in the high and low goals. 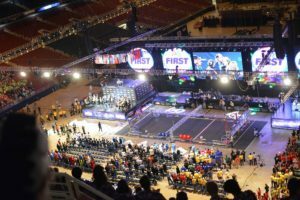 Alliances receive large bonuses for “assists,” which are awarded every time a different robot takes control of the ball in its own zone. 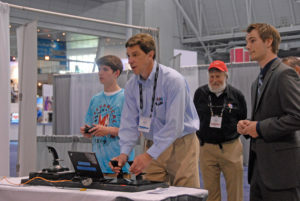 Stressing the application of Coopertition® and teamwork, Aerial Assist promises an exhilarating FRC season.